How far is it possible to cycle in a day? If you are really fit, 60-80 kilometres a day is not unrealistic. Otherwise, you should limit yourself to 30-40 km a day. Remember that a cycling holiday is also about all the little detours and surprises you find along the way. Make sure that you have enough time for spontaneous trips and experiences. Is it possible to rent a bicycle in Copenhagen and return it in Berlin? Yes – as well as the other way round. MTB-tours in Værløse (Copenhagen) and Fahrradstation in Berlin have teamed up to allow you to rent a quality bicycle in one location and return it in the other. This means that you do not have to cycle both ways or have to worry about transporting your bicycle back to your home. Where can I safely park my bike in Copenhagen? When you book your hotel in Copenhagen, you should ask if the hotel offers safe parking for bikes. Bed+Bike hotels provide this service. Apart from the hotels, the garage City Auto in the centre of Copenhagen offers safe bike parking. Am I able to recharge my electric bicycle along the way? Yes. Charging points are available every 40 km along the route so you do not risk running out of power. Click on the icon for charging points on the map to view a list. It is wise to bring some tools: tyre lever, puncture repair kit/extra tube and, of course, a bicycle pump. You will also find bicycle shops in many locations. The majority of Bed+Bike accommodation options have puncture repair kits available. Will there be shops along the way? Yes. You will pass many shops and supermarkets as well as cafés and ice cream kiosks where you will be able to buy refreshments and light meals. The entire route between Berlin and Copenhagen is sign-posted. In Germany, follow the signs with the route logo. 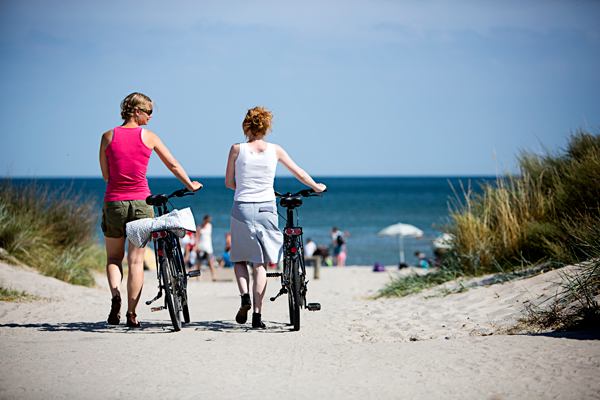 In Denmark, follow the signage of National Cycle Route N9. On Møn, follow the signage of National Cycle Route N8. Useful information can also be found in Tips for Your Trip.